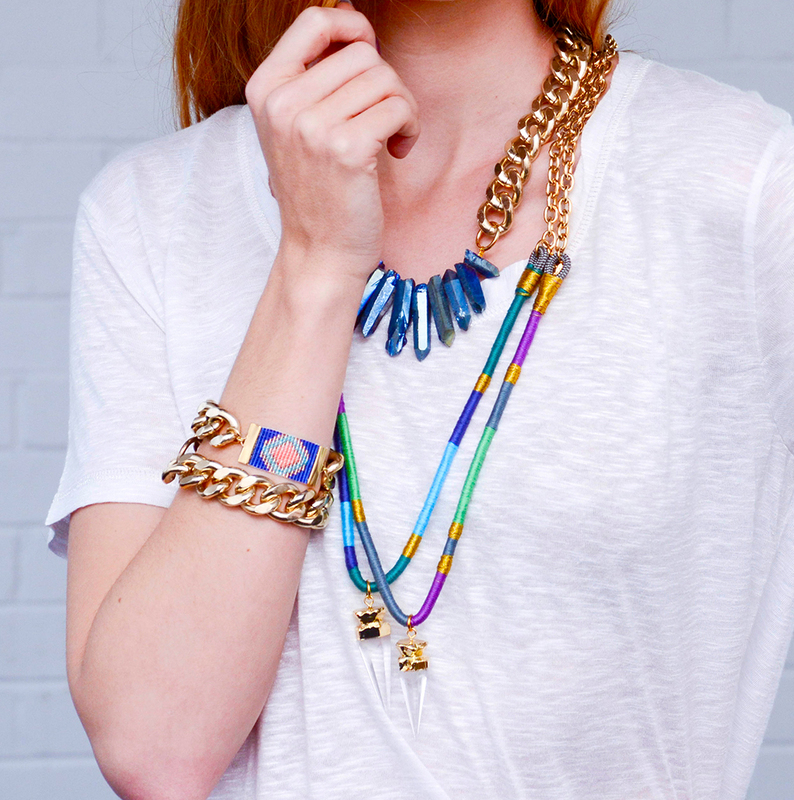 If you are looking for fun, vibrant stand-out jewellery for Summer, then look no further than Shh By Sadie, the latest jewellery designer to hit the shelves of the Apache Rose Boutique. Clearly drawing inspiration from tribal designs and patterns, Sadie uses vibrant colours, intricate beading, chunky chains and semi-precious stones to create unique, striking jewellery. Here at Apache Rose we like to delve inside the minds of our talented designers to see what makes them tick. Read on for 5 minutes with the fab Shh By Sadie in our latest designer spotlight. Where do you draw your inspirations for designs from? Usually from the materials themselves. I play with beads, colours and chains until I find something that makes me say "wow", and then I make it. What other designers are you inspired by? I've been a fan of Australian jewellery designer Sollis for a number of years. I used to live in New Zealand and came across her necklaces in a local boutique. I have one of her pieces and the craftsmanship is amazing. I am also a new lover of Italian shoe and handbag designer Gedebe - I can't resist colour, print and a good does of bling! How important is it to be ethically minded in today's fashion world? Extremely important. I have many friends who campaign for re-use, repairing and re-purposing in the fashion world. One particular friend is a fashion designer who has taken the wasted uniforms from New Zealand Post and re-invented them into gorgeous clothing. I'd never even really considered what happened to old projects until her project! When you realise how much waste is created in the fashion world, you can't help but be horrified and spurred into action. Of course, it's hard to be the perfect consumer, but little steps like shopping less, shopping more ethically, and buying items that last longer than one season help in a big way. How did you get into jewellery design? I began teaching myself to make jewellery while my partner was overseas for travel, and I was keeping myself busy! I was living in Wellington, New Zealand, and soon I had made enough jewellery to open an Etsy store, and then next came local markets and local boutique stockists. It's been a fun, challenging journey, learning everything as I go along, but I love it! What does the future hold for Shh By Sadie? I'm about to release a brand new collection for Summer, which I'm very excited about - think of exotic prints, patterns and of course plenty of colour!